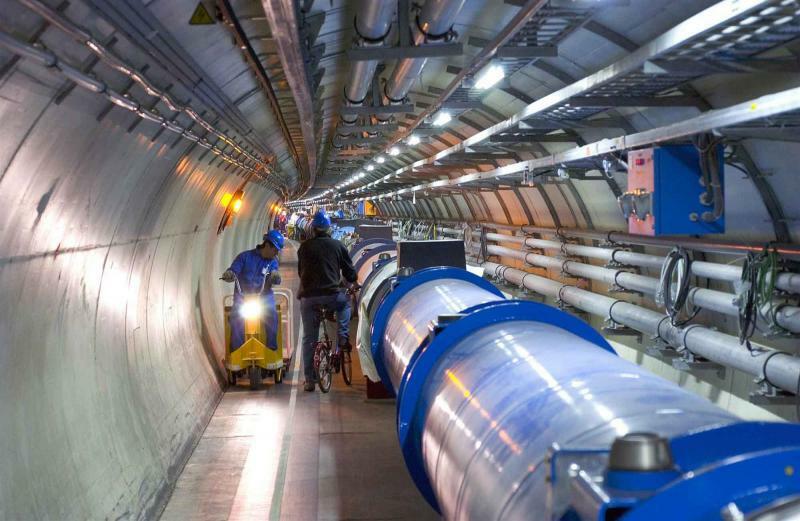 After two years undergoing upgrades, the CERN Large Hadron Collider is gearing up for a new round of experiments, and things could get interesting this time. If scientists detect miniature black holes when using the Large Hadron Collider it could prove the existence of parallel universes and possibly disprove the Big Bang theory. Scientists at Cern in Switzerland believe the particle accelerator, which will be restarted this week, might find miniature black holes at a certain energy level. This could prove the controversial theory of “rainbow gravity” which suggests that the universe stretches back in time infinitely with no singular point where it started, and so no Big Bang. The theory was postulated to reconcile Einstein’s theory of general relativity, which controls very large objects, and quantum mechanics, which affects the tiniest building blocks of the universe. It takes its name from a suggestion that gravity’s effect on the cosmos is felt differently by varying wavelengths of light. Mir Faizal, one of the authors of the study published in Physics Letters B, said: “Normally, when people think of the multiverse, they think of the many-worlds interpretation of quantum mechanics, where every possibility is actualised. This cannot be tested and so it is philosophy and not science. This is not what we mean by parallel universes. What we mean is real universes in extra dimensions. Is the LHC about to find a parallel universe? Currently, it is thought that if there are only four dimensions, the energy required to produce mini black holes would be far higher than what the LHC can achieve. However, more dimensions would mean less energy to produce them – which the LHC could do. This is because gravity in our universe could flow into the extra dimensions. The authors believe the current models of gravity used to predict mini black hole production are not quite right because they do not account for quantum effects. In their theory, they have modified models to allow for this. Should these mini black holes be detected, it would support several theories about extra dimensions and parallel universes. If they are not found, several other possibilities could emerge. The existence of parallel universe is an intriguing concept. Imagining it offers almost infinite possibilities to you wearing different clothes to a world where there is no ISIS Terrorist or Climate Deniers, people who made the word “Climate Change” taboo because they are not convinced by it, as stated on thinkprogress. Or better yet, a parallel universe where people are united and work together for one, single common goal—preserve life for up to billions of years not nuke each other out. Bottom line: Europe’s multi-billion dollar Large Hadron Collider will begin its second three-year run in may with twice the energy and far more violent particle crashes this time around. Scientists say if nature cooperates, the more powerful beam crashes will give them a peek into the unseen dark universe.